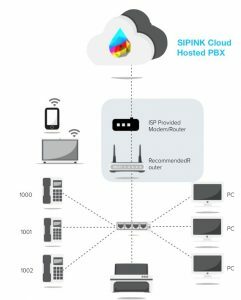 SIPINK supports any phone that talks VoIP, however we do only support some of them. However as with every networking device that is mission critical it need to run on enterprise grade hardware with a broadband internet connection. Each phone must be issued an IP-Address from the router (Not modem) via DHCP or Static. In order to ensure perfect call quality we recommend an ethernet switch with QOS capabilities. Most routers come equipped with firewalls, which is used to protect your network from malicious attacks. Your firewall should be setup with port forwarding of TCP and UDP for your phones. All SIP Phones need a strong and stable internet connection in order to function properly. Each call over SIPINK uses around 100kbps of bandwidth. If you have a typical T1 connection of 1.5mbps you can make up to 15 concurrent calls as long as no other internet activity is going on. Since in most cases both Phones and desktops share bandwidth you would see a drastic drop in the bandwidth available in these phones. If in doubt please contact your service provider to get a clarification. *Please note that this is a live list, and changes often according to firmware updates of the provider we tend to add more supported ones. Whilst these routers are considered black listed, that in now way means it will not work, we just have seen call quality issues with them, therefore in our promise to provide perfect call quality, every time. We must place these on our blacklist. For HD calls SIPINK requires that phones have 100kbps bandwidth to make and receive calls. If you experience any of the following you might need to upgrade your bandwidth. Latency: If you ping our servers from your internal network and experience anything above 100ms. Anything above 150ms will mean a degradation in call quality. Packet Loss: Data from the network that is lost in transit. Packet loss should never exceed more than 1%. If you see packet loss you should get in touch with us and your bandwidth provider. SIPINK is quite often willing to implement a new server in a region close to you quickly.